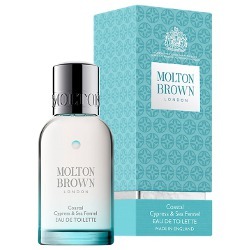 Molton Brown has launched Coastal Cypress & Sea Fennel, a new fresh fragrance for men. A sea-soaked Eau de Toilette from Molton Brown immersed in earthy aromas of cedarwood and musk and a wash of salt-sprayed cypress. An exploration of uncharted depths; perfect for the modern gentleman. The notes include fig leaves, cardamom, bergamot, marine notes, jasmine, violet leaf, salted cypress, cedar and musks. Molton Brown Coastal Cypress & Sea Fennel is available now at John Lewis in the UK, in 50 ml Eau de Toilette and matching grooming products.